Danish merchant; born in the Island of Saint Christopher on Aug. 6, 1795; died in London, England, Jan. 12, 1872. He was a descendant of Daniel Robles de Fonseca. Soon after 1814 he removed to the Island of St. Thomas, Danish West Indies, where he was appointed to the office of "Stadthövidsmand" (mayor), which ranked him next to the governor of the island. He received from the King of Denmark the decoration of the Order of Dannebrog; and he was a member of the Royal Council; president of the Bank of St. Thomas, which he managed for thirty-two years; chairman of the Marine Slip; president of the St. Thomas Marine Insurance Company; and for many years president of the synagogue. 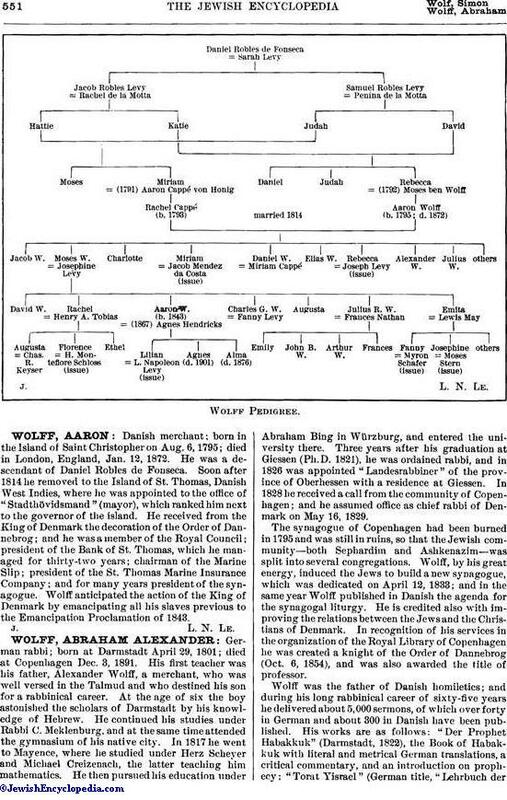 Wolff anticipated the action of the King of Denmark by emancipating all his slaves previous to the Emancipation Proclamation of 1843.